The picture is a rheostat brake resistor of a latest locomotive and is loaded into the locomotive which hauls a grand freight train , and is used for suppression of speed and braking. 1185kW･1440kW type is installed in the car of the locomotive, and 507kW type is installed under the floor of the locomotive. 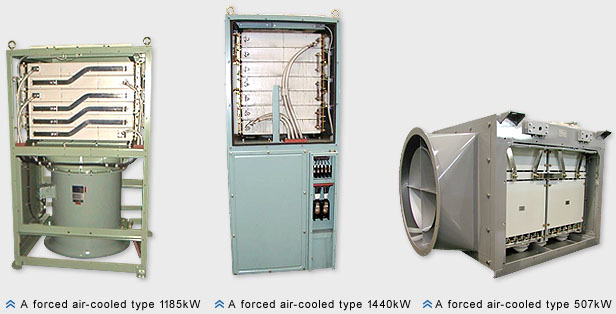 The compulsion cooling system by the cooling style of the ventilator is adopted because a resistor has a very large capacity. A temperature protection detector is included so that a resistor isn't damaged even when a ventilator breaks down. Resistors for other Rolling stocks are as below.